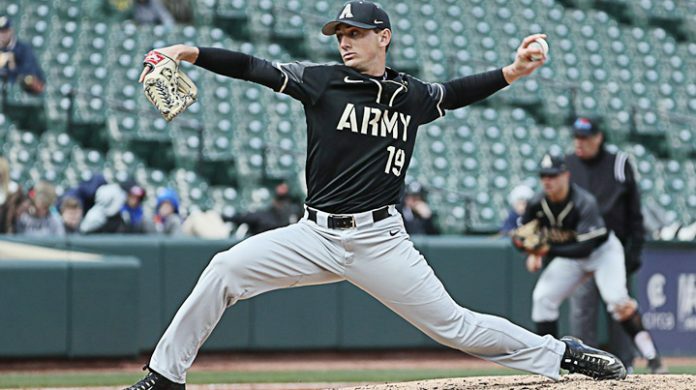 The Army West Point baseball team dropped a heartbreaker to Bucknell Sunday after the Bison scored four runs in the bottom of the ninth to steal the 7-6 win. LEWISBURG, PA. – The Army West Point baseball team dropped a heartbreaker to Bucknell here Sunday after the Bison scored four runs in the bottom of the ninth to steal the 7-6 win. The Black Knights held a 6-3 lead heading into the final frame but three hits allowed and four walks, one intentional, ultimately doomed the visitors. Army was looking for its first weekend sweep after wins in both games of Saturday’s doubleheader. With Sunday’s victory though Bucknell ended that hope and earned its third Patriot League win of the year. The Cadets dip to 4-3 in league play. John McKenna brought home two of Army’s final six runs in the game. He closed out his day 2-for-4 with a run scored. Anthony Giachin, Blake Ledoux and Drake Titus all added runs batted in, while Jacob Hurtubise accounted for two Black Knight runs. Starter Daniel Burggraaf went the first 6.0 innings allowing five hits, one walk and just one run. The senior also struck out six in the no decision. For the sixth-straight game Army struck first with a run in the opening half inning. Hurtubise started things off earning a leadoff walk. He advanced to second on a throwing error before shifting to third on a groundout. Two batters later Hurtubise stole home for his first steal of the game. The home side pulled even in the bottom half of the first when they registered a one-out singled through the right side to score a runner from second. The Black Knights broke that deadlock in the fourth when they recorded two runs on two hits. Walden led-off the frame singling to the shortstop. McKenna then followed suit with an RBI-double down the left field line. McKenna advanced to third on the play as well after the Bison tried to throw Walden out at home. During the next at bat Ledoux tallied an RBI-groundout to score McKenna and hand Army the 3-1 edge. Two more runs came home for the Cadets in the fifth, extending their advantage to 5-1. Hurtubise found himself on third with two outs in the frame. Giachin then doubled to left field to easily score the junior. After a Walden walk during the ensuing at bat placed two runners on, McKenna drilled his second hit of the game to score Giachin from second. The Cadets started the bottom of the seventh with a pitching change. The home side quickly jumped on the change and finished the inning with two runs on no hits to cut into the lead at 5-3. Bucknell tallied four walks during the inning as well. Army grabbed one of those runs back in the eighth when Titus hit a bases loaded single to score Ledoux. The Black Knights took their 6-3 edge into the bottom of the ninth but three-straight singles and numerous walks ultimately hindered the visitors as Bucknell put up four runs to steal the win. Army welcomes out-of-conference foe Cornell to Doubleday Field on Wednesday. First pitch for that midweek contest is slated for 3 p.m.